Brigida was born in the little sea-side town of Rapallo which was part of the noble city of Genova Rapallo. Her parents were Nicolo Morello and Lavinia Borzese,both were noted for their goodness and prudence were also and capable of governing their family well. They enjoyed the respect and esteem of the people and had good financial standing. But one day they suffered a considerable set back due to some misfortune and had to live through days of hardship and want. They had 11 children: three boys and eight girls of whom Brigida was the sixth in the order of birth-the central figure, not only in the natural order but much more in the supernatural order of divine prediction and gifts of grace. 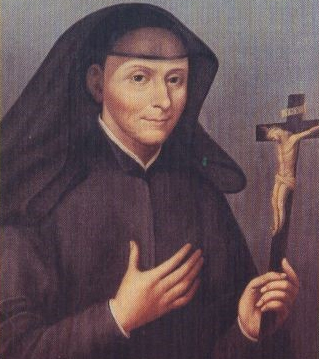 She was born on 17th June, 1610 on the day which, that year happened to be the Octave of the feast of ‘Corpus Domini’ in the parish of St. Michael, not far from Rapallo. The birth was not accompanied by the usual labour pain and the mother did not even need the assistance of a mid-wife. In fact, she had gone to the Eucharistic procession and returning home had hardly changed her clothes. This was believed to be very providential l in the given circumstances as there was only a single mid-wife in the whole parish and she could not be called for this delivery. 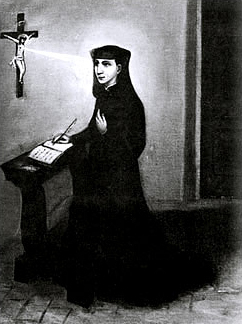 Venerable Brigida of Jesus in the early years, as Prioress of the new foundation, writing the rules of the Congregation before the crucifix. The children of the Nicolo family often went to their paternal grand-uncle and aunt who had holiday villa in St. Michael’s . This couple, having no children of their own, entertained them in their home. Brigida was their favorite. The children affectionately called them grand-father and grand–mother. The good old man was very pious and devoted his time in reading and especially enjoyed reading the lives of saints which Brigida used to listen very eagerly. Even at that tender age, she understood that to become a saint was a beautiful thing and this roused in her a desire for sanctity beyond her age, as though the lord was anticipating his action in her with special enlightenment, which often happens with those who are destined to be models of sanctity. Greatly favored by grace from her early childhood, she possessed in a high degree the gifts of contemplation, prophecy and of miracles. 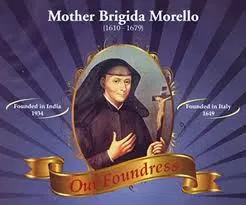 Brigida Morello, a name that has occupied a place in history. She was a mystic of the 17th century, endowed with special gifts of mystical union with God . At that time women hardly had any place in society. But this lady of vision overcame obstacles of all types. Petty wars and Industrial revolts had played havoc, creating instability in families. Women and children were the worst affected. Brigida could not be blind to the need of the hour. Responding to the call with six other ladies, Brigida dedicated herself to the cause of the education of the young girls. Thus was born the Congregation of the Ursulines of Mary Immaculate (UMI), at Piacenza, Italy on February 17th 1649. The Lord revealed her that within three months her earthly pilgrimage would be ended and this increased her spiritual joy as proportionately increased her physical suffering. The Lord also told her that she would have yet to suffer much and from then on new pains were added to her each day so that within these months she had reached the points of death many times. Heaven found Mother ready for it and so the prayers of her daughters went unheeded. So after a steadily increasing agony that lasted the whole night, with the confessor and her daughters by her bed-side praying and recommending her soul to God, she smiling at the crucifix, breathed forth her soul to god at 3.a.m. on Sunday the 3rd September 1649 amidst the tears of her daughters. She was sixty nine years old at her death.